There's nothing worse than sitting down on a frigid toilet seat on a cold winter morning, but according to InventorSpot.com, one Japanese company may have a solution. LEC Inc. has created a line of toilet seat liners that come in a host of colors, patterns and materials that can make your throne all the more enjoyable. While the idea of sitting down on the same liner each day may not seem very hygienic, the toilet seat liners can be thrown in the washing machine every week and can last for up to six months. With everything from faux fur to colorful patterned fabric, this could really add a homey touch to a person's drafty bathroom. 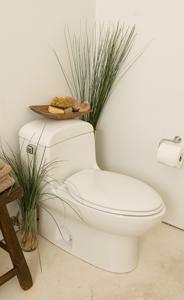 The liners are also a means of conserving energy - many Japanese toilets feature self-cleaning seats called washlets. This will cut out the energy usage that these devices take advantage of, instead giving a person a plush option when they need to do their business. LED Inc. has certainly made toilet seat liners easier for people who want to incorporate them into their homes, but the question remains, would you ever use one in your washroom?